Sewn items are all the rage in fashion trends again. Especially, quilted designs. A lot of people enjoy having customized patches, but they are quite pricey. With that in mind, it’s better just to do it yourself and save money. The problem with that is that there are a ton of different types of sewing machines in the market today. If you’re sewing on a budget, then you might be looking for affordable sewing machines. We understand that need, which is why we compiled the top three choices for best sewing machines under $200. We hope that our list can help you find the sewing machine that suits your needs, and gets the most value out of purchasing it. Finding a product that gives you the most value out of your purchase has the most appealing features. The Brother CX155LA series is one of the sewing machine options that you can purchase for under $200. This machine has 100 stitch styles and close to a dozen accessory feet. Aside from that, you can use this machine to quilt as well. There are several notable features of this sewing machine, which we feel qualifies it to be on the list of the best. The CX155LA model has over 155 stitches in its computerized system. Fifty-five of these stitches are Alphanumeric for simple monogramming projects. Aside from that, they have eight buttonhole stitches that can cater to light and heavy fabrics. The table of this sewing machine is 33% larger than the average sewing machine and comes with a larger table to cater to extra large projects. Aside from that, the fastest speed it can go into is 850 stitches per minute. The speed and size of the workspace make for valuable features. This is particularly ideal for those of you that enjoy large projects. These features are adjustable to cater to your needs. You can easily adjust the features and maneuver it to the shape you need for your project. This is ideal for beginners that want to improve skills. The CX155LA sewing machine has eleven feet settings for sewing and quilting that can easily be switched. This is ideal for you to create more complicated projects. You can use it for any creative project from customizing quilts to adding zippers in shirts. This is ideal for those of you that have more experience with quilting and sewing. For those of you that enjoy customizing your clothes, you can now have your own versions of embroidery at the tip of your finger. 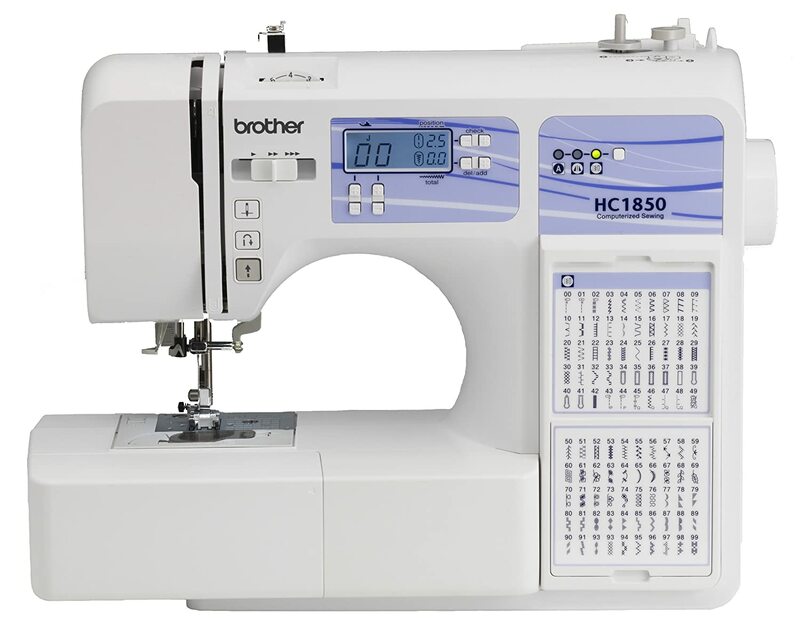 The Brother HC1850 is a sewing machine that is worth recognizing because of how easy it is to use. The machine comes with 130 stitches, and some more core features that will help bring out the fashion designer in you. Something to consider is that it cannot take on king sized quilts and it has one monogramming font. It’s pretty straightforward when it comes to using the machine, and can take on just about any fabric as long as you use the appropriate needle. This is ideal for those of you who are just starting out with a sewing machine. Similar to the Brother Laura Ashley CX155LA, this sewing machine has adjustable sewing speeds. However, there are only three-speed adjustments available. This will be easy to figure out if you are used to the traditional pedal of older model sewing machines. Aside from that, the button that comes with the machine is essential if you are handicapped. Learning how to gauge your stitch speed will help your stitches be straighter and neater. Some of the heavier fabrics require a much slower speed to get precise stitches. With the button, you won’t have to feel intimidated when you adjust your speed. The Brother HC1850 can work with a wide variety of heavy fabrics because of its feed system. With the right needle, you can work with multiple layers of denim too. However, with heavier types of denim, it is recommended that you use a special needle that can easily pierce the fabric without causing the sewing machine to get off-balanced. We recommend that you go with a heavier industrial sewing machine if you plan on working on heavy fabrics. The sewing machine comes with two needle sizes: size 14 and size 16. The size 14 needle works well with faux fabric. The Janome 2212 is a mechanical sewing machine with an entry-level price point. However, you shouldn’t dismiss this machine so quickly because it is one of the best sewing machines under $200. 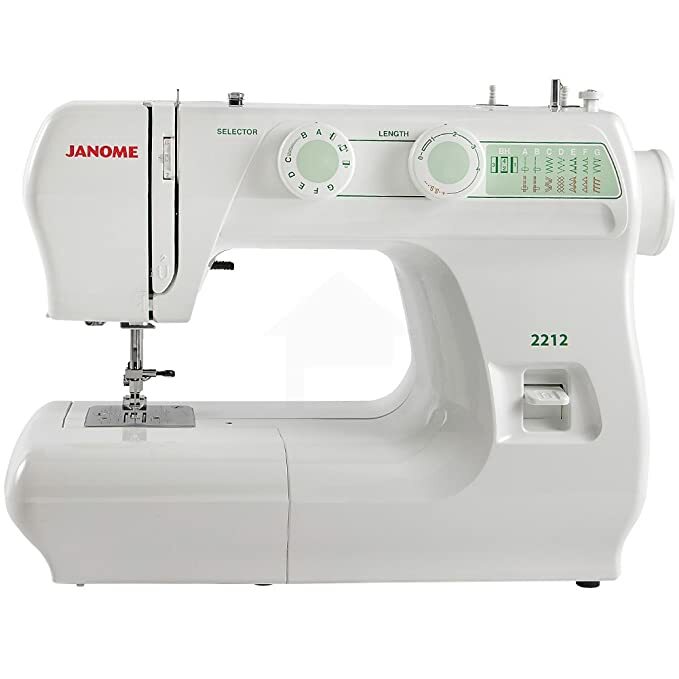 If you are a beginner and you’re looking for a good machine, the Janome 2212 is ideal because it offers the basic functions a sewing machine has with features that are helpful for even the oldest seamstress. Learning how to use this sewing machine would require reading the manual. Although tedious, it’s always good to learn how to use it to be able to utilize the machine fully. The free arm of the Janome 2212 allows you to sew cylindrical shapes easily. Should you need to sew in cufflinks or hem a pair of pants, the arm allows you to do just that. This can help you if you are a beginner looking to improve your sewing skills. Aside from that, it is ideal if you enjoy quilting. The sewing machine’s space is large enough for you to quilt with ease. For some sewing machines, it’s quite difficult to work on small cylindrical shapes because the machine doesn’t have additional space for you to fit the cloth. The drop feed allows you to disengage the feed system that comes with the Janome 2212. The problem with this is that the drop feed is located at an area that requires you to stop to engage or disengage the feed. Although this is ideal for working with big projects like quilts, the feed would be able to handle length. Lots of people with the same sewing machine have commented that they do not use the drop feed feature because of the inconvenient location. It’s easier to keep the feed engaged than to decide halfway that you need to disengage. A lot of people think that $200 sewing machines will give you the most basic stitches. Although it is partially true, you can expect that you get the value for your money which is important. The only difference between these machines and more expensive machines is that the more expensive sewing machines have more settings and more luxurious features. The computerized mechanism in the machines makes it much easier to switch between stitches and speeds, as compared to traditional machines. Not all premium sewing machines are worth the splurge, and knowing what you will be really helpful for your sewing machine choice. Which one is the Best Mechanical Sewing Machine Under $200? We feel that the Janome 2212 is the best mechanical sewing machine under $200. It has 12 stitches that help you learn when you are new to it. Aside from that, it is relatively easy to use when you are familiar with its functions and features. It’s a relatively lightweight machine, which makes it easy to transport around, it’s not like traditional machines that were really heavy. Despite having only 12 stitches, you can ensure that every stitch is of great quality. Our only complaint is that this sewing machine is not ideal for heavy and multi-layered cloths like denim or velvet cloth. Which one is the Best Computerized Sewing Machine Under $200? We have listed two sewing machines that are computerized, and by some deliberation, we agree that the Brother Laura Ashley CX155LA is the best-computerized machine. With 155 stitches and speed of 850 stitches per second, we believe that you do get the value of your money from this product. Although the Brother HC1850 is a worthy contender, we believe that the Brother CX155LA gives you more value from its stitches and features. We believe that you may have satisfactory results with this sewing machine, and it’s an easy way to get into sewing and quilting, and you can adjust the stitch speed. Among the three sewing machines we reviewed, we find that the best sewing machine of them all is the Brother HC1850. It’s computerized and can handle heavy fabrics which we agree is a necessity. Lots of other reviewers agree because of its affordable price point and features that it is worth the buy. With the HC1850, you can layer multiple clothes and still be able to stitch with ease, and should you need a specialized needle; then you can easily attach it to the sewing machine. We do suggest that with heavier fabrics or projects that you invest in a more industrial sewing machine. 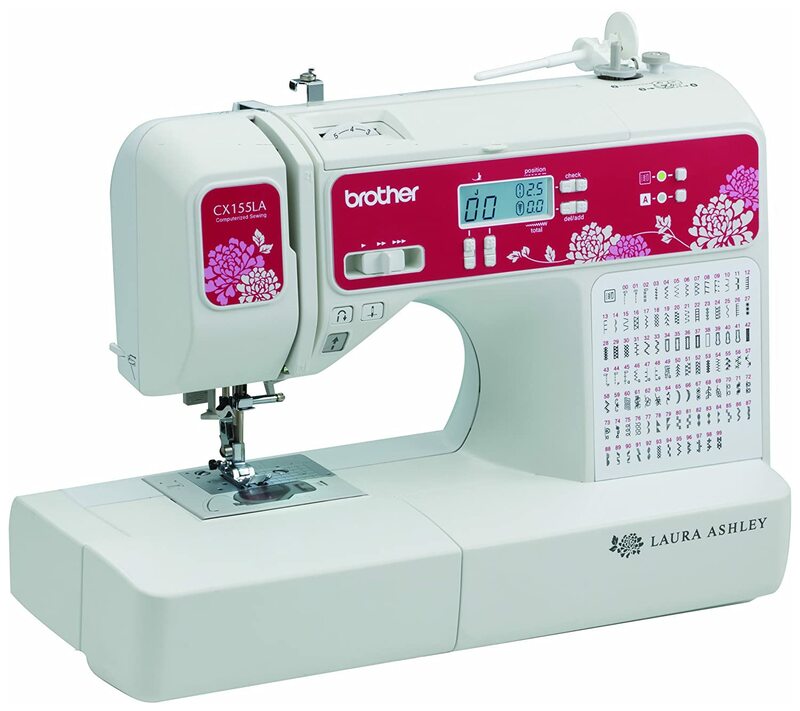 The Brother Laura Ashley CX155LA is great for quilting because it comes with eleven feet accessories that cater to quilting alone. Aside from that, with 155 stitches in its roster, you can be sure to find the perfect stitch for you. The Brother CX155LA has features that cater to what you need at an inexpensive price. This sewing machine is the most expensive under this round-up review, but we do think that it is worth spending on. If you ever want to quilt a king-size blanket, then you can do so with this machine with no difficulty, and there are no learning curves. The Brother HC1850 is the best sewing machine for sewing denim or jeans because it has needles that can cater to the fabric type. Aside from that, you can rely on this sewing machine to keep its balance despite the weight of denim. A lot of times, we advise that you get the specialized needle for denim to avoid damaging the needle, and so that you can easily pierce the fabric. Since denim is such a thick project, we suggest you take precaution to take care of your sewing machine instead of putting it at risk of damage. Another warning that we think is important is that you should keep the speed to slow speed or even middle speed so that the needles don’t get damaged when sewing denim. Although the machine is made to take on heavy fabrics, you should still take care of how you use it. Some people enjoy the idea of sewing heavy fabrics at a speed of 850 stitches per second without realizing the damage it puts on the needle and the balance of the machine. Most of the time, people realize too late that they’ve done major damage after a few years. The sewing machine is strong but can be damaged if abused. For heavy projects, it takes time and patience to get the result that you want. For this category, we feel that the Janome 2212 is the best option because it’s easier to maneuver, and is ideal for projects that don’t require very heavy projects. This would also be the ideal sewing machine for light projects like costumes or even small accessories. Aside from that, we feel that this is ideal for children or teenagers that want to learn how to sew small arts and crafts. This is a good starter sewing machine for kids because it’s very simple. Despite not having an automatic threader, we still believe that this is one of the best machines to use. Especially for beginners that like to learn new things, this sewing machine gives you the basic stitches and some quilting stitches so you can hone your skills. The sewing machine comes with a manual to teach you how to change stitch styles, and it has a speed of 860 stitches per second. Using a high speed with light fabric is fine because you won’t cause the machine to lose balance. Sometimes when you sew heavy fabrics at high speed, it causes the machine to imbalance, and you can damage the needle. When you use high speed on heavy fabric, the needs have a difficult time going through it because the fabrics are thicker than light fabrics. Considering this can help conserve your machine. The Brother HC1850 is the best for heavy duty projects because it can handle heavy fabrics and multi-layered cloths. It has 133 stitches, which is less than the Brother CX155LA but has the durability to take on denim cloths. Other reviewers agree that this is the best sewing machine under $200 for heavy clothes without being an industrial machine because of its features. Many of the stitches in the HC1850 is for sewing and some for quilting, but you can enjoy its features with any cloth. When it comes to multi-layered cloths, we do suggest switching machines because although this machine is able to take the weight, you can damage the needles which would be costly to repair. It’s always good to keep in mind that you should work on heavy-duty projects at a slower speed so that you do not damage the machine and the needle. There are specialized needles available for heavier and more layered projects. This is one of the best machines under $200 because it can take on heavy cloths and it is computerized. The stitches of this machine are neat and tidy, and if you want to switch stitches, you can easily do so at the press of a button. This way you don’t have to stop and switch when you want to change the pattern of your stitches. We have come to the end of our round-up review, and we must say every choice is appealing. All the machines prove to be worthy and full of value. We think this may be one of the best purchases should you decide to get one of the machines reviewed. Although we review two computerized sewing machines, the Brother HC1850 has shown its strong features and has won us over. The Janome 2212 is charming in its own right as a mechanical machine and might be what you’re looking for if you’re only starting to learn how to sew. All three machines have shown their uniqueness and how they can enhance your creativity in their own little way. When choosing the machine, pick the one that suits you the best. All of these machines are under $200 and a good thing to invest in. The priciest machine in this list is the Brother Laura Ashley CX155LA; however, you do get your money’s worth because of its features. To conclude, we believe that these three are the best sewing machines under $200 and you can keep it as an investment if you care for the machine properly.